A theatre sound designer/composer, a live-acoustic-music engineer, field recordist, and sound-effects creator. 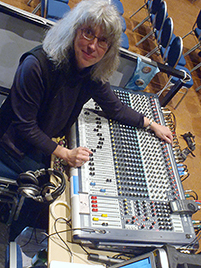 Lucy Peckham is a Chief Sound Engineer of the the Anchorage Folk Festival, the Alaska Folk Festival, and the Spenard Jazz Festival, and an independent contractor, Lucy works in all music styles that have their roots in folk traditions. Genres include Americana, Singer/Songwriter, Bluegrass, New Grass, and all the Celtic/Gaelic styles, Old Time, Cajun, Zydeco, Creole, Jazz, Blues, Swing and fusions of all of the above.As a sound designer she has been privileged to design for many fine theatres since 1987. Lucy has recorded and created sound effects since she began studying sound design in college. Now,she is with sound effects partner Mike Sakarias, Both Ears Live Sound records, collects, and produces custom sound effects for sale.